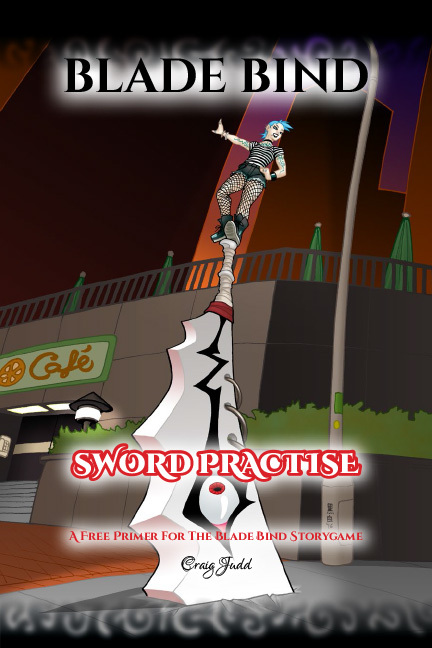 I just released Blade Bind: Sword Practise, a FREE introduction to the card-based duelling system that forms the mechanical heart of Blade Bind. With it, you can get a feel for the sword-fighting and test your skill against a friend or a random game-controlled NPC. A character creation system that sets the Chosen up in a web of conflicting goals. Techniques that make each of the predefined Blade flavoursome and unique. You can also pick and match to create your own custom Blade. A Will/Power system that tempts you to increase your power while walking the fine line of control over your Blade. Winning a Duel gives you the power to achieve a goal, or rewrite a goal for yourself or one of the losers. Quickstart setups for a three or four player game. Advice for facilitating a session. I still have some illustrations to do, but the bulk of the editing and layout is done already. 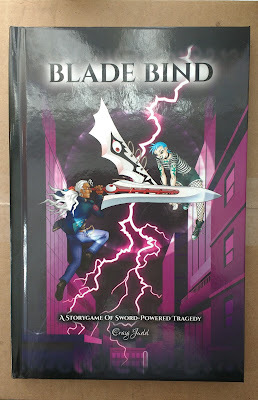 I'm planning to run a small Kickstarter in the next couple of months, mostly so I can pay for an editor to give it a once-over, and also to crowd-source a bunch of external feedback and playtesters so I can get it into the best possible shape before releasing the PDF and print-on-demand books to the public. I'll talk more about my Kickstarter plans in another post.